- Publisher Sometimes life hits you right in the solar plexus! What do you feel that you need most when you are having a problem? Someone to listen and maybe give some encouragement and advice? Start with this book, and let Jim Burns recommend ways of getting help. 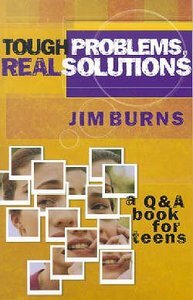 And let him give you some personal support and practical help that comes from his years of loving and caring for teens. .
About "Tough Problems, Real Solutions"
Sometimes life hits you right in the solar plexus! What do you feel that you need most when you are having a problem? Someone to listen and maybe give some encouragement and advice? Start with this book, and let Jim Burns recommend ways of getting help. And let him give you some personal support and practical help that comes from his years of loving and caring for teens. .